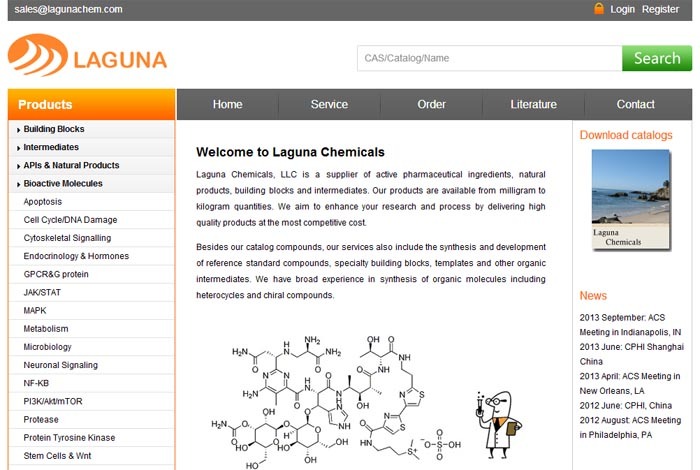 Laguna Chemicals, LLC is a company registered in Delaware, US and is being operated in Shanghai China. We are a supplier of active pharmaceutical ingredients, natural products, building blocks and intermediates. Our products are available from milligram to kilogram quantities. We aim to enhance your research and process by delivering high quality products at the most competitive cost. Besides our catalog compounds, our services also include the synthesis and development of reference standard compounds, specialty building blocks, templates and other organic intermediates. We have broad experience in synthesis of organic molecules including heterocycles and chiral compounds.